By the mid 1870's the concept of "Cat shows" was now an accepted phenomenon and well established. They continued to capture the imagination of Victorian spectators, used to a regular diet of "Naturalist" exhibitions. The media of the day continued to give such events consistently good coverage, including The Illustrated London News, The Graphic, The Pictorial World, and the Illustrated Sporting and Dramatic News among others. Shows proliferated to other centres, to Birmingham notably, but also to Ipswich, Wolverhampton, Glasgow, Brighton and Exeter, and other cities; but the Crystal Palace Cat Show retained its prime position as the 'lecading' cat show in the country. This particular image comes from the October 16th, 1875 edition of "The Illustrated Sporting & Dramatic News". It was drawn by Mr R H Moore, who was well-known for his coverage of Dog and Agricultural Shows. Such images are of significance as they assist in putting these events into an historic and social perspective. They are also a valuable eye witness record and a useful snapshot of social commentary at the time. The Show took place on October 5th to 7th, 1875. The Judges for this show are recorded as: Mr Harrison Weir, Mr J.Jenner Weir, and Dr Gordon Stables R.N. Of particular note for this show, is that the Patrons were Lady Dorothy Nevill and Mr Charles Darwin. 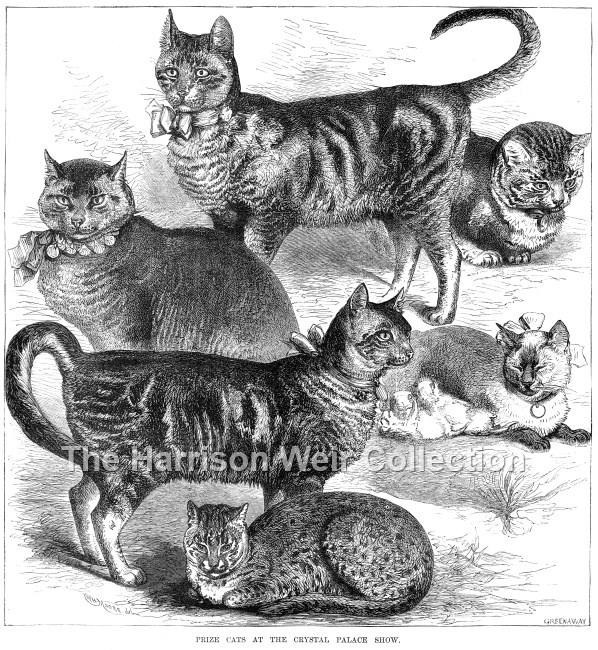 Also of note, is the Indian Wild Cat, at bottom of illustration, shown by Mr George Billett, who later became a Cat Judge and officiated at Crystal Palace Shows during the 1880's and 1890's. The Siamese with kittens in this rendering, was named Mymie, owned by Mr J.Walter. Mymie was recorded as 5 years old, making her birth date 1870. She took First prize for shorthaired unusual coloured she-cats!